About a year ago, Dell sent me their newest 34- inch curved display to test. Up until then, I had a 24 -inch monitor at my desk, tied to my laptop. That monitor allowed me to see one app at a time and forced me to switch apps I was using for any given task regularly. I found out quickly that with a larger widescreen monitor I could put three apps up on the screen and work with them as needed. On the left side, I have my email app. In the middle, I have Evernote, my go-to app for notes and writing first drafts of my columns. On the right, I keep a browser window open which, when writing allows me to check related info as well as peruse Twitter, Facebook and many other tabbed sites for use as needed. That new monitor and the ability to work with multiple apps was a productivity game changer for me. And it has made my overall workflow much more comfortable as I can see activity on all of the open apps all of the time. Last week, Dell added another curved display to their line-up, a new 49-inch model that makes it easy to add a fourth app to my viewing screen. I have been testing it for a week or so, and this new 4K monitor is the best monitor Dell has ever brought to market. Besides having exceptional clarity and supporting 4K, its curved wide viewing angle makes it easy to see and use four apps simultaneously a breeze. I may be a bit unusual working with four open apps at a time, although I know that in financial markets where they track stocks and multiple finance sites, having 3 or 4 apps open simultaneously is the norm. I suspect having four sites open at a time may be too much for mainstream users, but for me, it dramatically impacts my workflow. 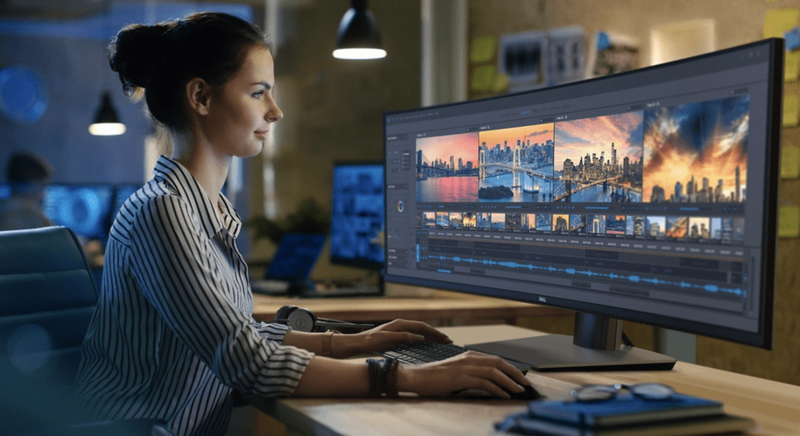 What is interesting to me about this new Dell monitor and their overall commitment to creating world-class monitors in general, is the fact that they see monitors as an essential part of the workflow. To them, it is not just an accessory as so many monitors of the past have been positioned. For Dell, this is a strategic product that is part of their commitment to PCs. This mirrors the way Lenovo thinks of PC’s as both companies use PC’s to help them with their enterprise businesses and are a critical front end to delivering applications, security and a host of services that extend their reach into business accounts. And they make monitors a big part of the PC experience as it is more and more becoming a valuable tool that is added to the PC workflow to enhance productivity. Dell was the top seller of Monitors in 2017 and should be number one again in 2018. One other important thing about this monitor that was not in the 34-inch model I had before this is they have added USB-C to USB-C connections. When I installed the 49-inch model, I discovered the USB-C port on the back and assumed it was for other add-on’s or for charging mobile devices. But I plugged it into my laptop, and it immediately powered up this new 49 Inch display. Of course, it has all of the other video outputs such as HDMI, Display Port, and Thunderbolt support but the USB-C connection is a welcome addition since most mid to high-end laptops have advanced video cards and employ multiple USB-C ports. This new 49-inch monitor from Dell is pricey, coming in at $1599. However, the 34 -inch version is a stellar option at $749. From personal experience, I can affirm that from a productivity standpoint, these large screen full displays were a game changer. It would be tough to go back to a screen that can only handle open app at a time anymore.